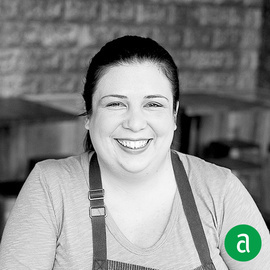 Marjorie Meek-Bradley, Executive Chef at St Anselm and Founder & Partner at Smoked & Stacked in Washington, DC, shares her career timeline and words of advice for up-and-coming professionals. I went to culinary school after high school without really knowing what I wanted to do. During my first semester, I fell in love with cooking. I got The French Laundry cookbook and was obsessed: I wanted to work for Chef Thomas Keller. After graduation, I went to Napa to eat at Bouchon, and I asked to talk to the chef to see if I could stage for a day. After the day-long stage, I got hired and worked my way up. My year at Per Se taught me so much. I worked there when Chef Jonathan Benno was the Chef de Cuisine. I learned so much about techniques and ideas. He taught cooking as a craft, rather than a recipe. This idea is what I try to instill in my cooks; it is such an empowering way to think about cooking. When hiring aspiring professionals, I like to ask them what their goals are, if they want to be a teacher, a chef. It tells me about how driven and ambitious they are. I also want someone who understands the importance of teamwork. To me, knowing how to balance both ambition and teamwork makes the ideal candidate. Organization is the number one skill. You can teach someone anything, but you need to be able to stay organized and clean when it comes to your prep. Alongside the “Me Too” and “Time’s Up” movements, I want to be someone who is part of the change helping the kitchen become a more positive and tolerant environment. As chefs, we can leverage our newfound notoriety as a way to be active and make an impact. Last year, I went to Capitol Hill with other chefs to support the Farm Bill and the SNAP program. I find inspiration in many places. The farmers’ market is probably the biggest one, but also what my friends are creating and cooking together at home, off shift. It helps me remember that it is about the food people are eating. I love to read cookbooks. I also love checking out Bon Appétit Magazine, they’ve rebranded themselves in the past two years and have a very cool mix of seasonal ingredients, ideas, and their photography is always fantastic. I still hang out at the pass in friends’ kitchens from time to time, to see what they do. Traveling is definitely another way of continuing to educate oneself. Wherever I go, I always try the local specialties.